Stefan Decker was born in 1989 in Bonn. He has been playing the recorder for over thirteen years which was added by flute and whistles many years later. He had whistle lessons with the well known folk musician Tom Kannmacher from Germany. In 2008 he discovered the love for traditional irish music and short time after that his first irish folk band was founded – DerElligh. He also is a founding member of the band Ceolma. 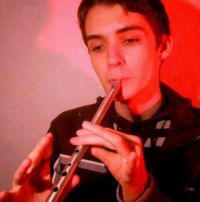 „I play music since the age of six, starting with the recorder over thirteen years ago and I also play flute and whistles. I have tried many different types of whistles but no instrument could persuade me like Colin’s did. You can hear the difference to ‘normal’ instruments at once. But it’s not just that the sound is beautiful. The soft vibrations you feel while playing have some kind of deeply relaxing effect to me. Since Colin made my Soprano High D there had been not one day where I didn’t play on it. We have become ’best friends’ and it did never abandoned me whenever I was in a session nor on stage with DerElligh or alone. Whether inside or outside, whether cold or warm it is always perfectly in tune. Thanks so much Colin and all the best for the future! Stefan Decker, DerElligh – Irish Folk"